Education: School of Visual Arts, BFA. Why theater? : Theater is one of the few sacred spaces that remains inclusive in the eyes of the audience. People from all backgrounds and cultural traditions attend the theatre with an open heart, prepared to enjoy their evening. I take that very seriously, and feel I have a responsibility to provide an honest account of the story I plan to tell in any given show. 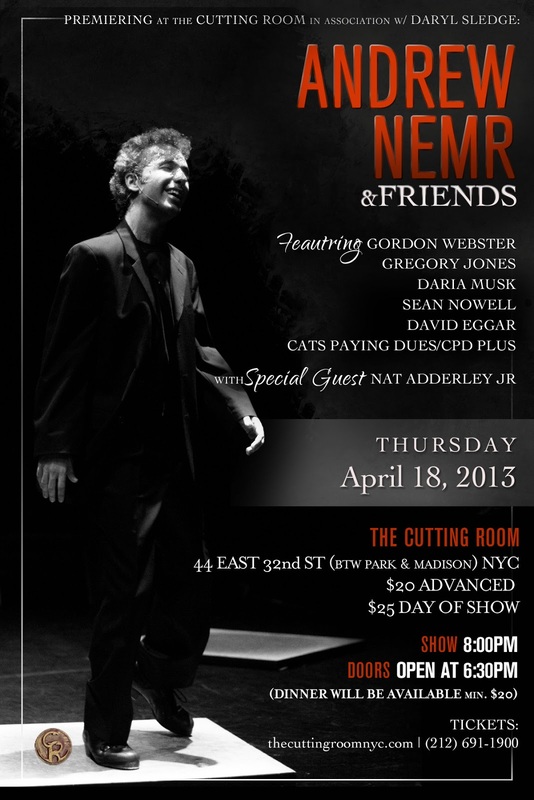 Tell us about Andrew J. Nemr and Friends? : Andrew J. Nemr and Friends is really a love story. It's the story of how I fell in love with tap dancing, the craft itself, and the people that take part in it and surround it. We talk about the moment I fell in love, what it was like to have amazing mentors and then lose them to the cycle of life, and the joys of sharing the continual pursuit of that first moment with friends that I've met along the way. What inspired you to create Andrew J. Nemr and Friends? : I can't say there was any particular thing. I've had a very blessed life, with supportive parents, and friends that continually inspire me and with whom I've been able to share some amazing moments. Over the past two years, I've been stretched as an artist, and challenged by some very special friends to really tell my story. It seemed like the right time to shake up the mold I had cast for myself. What kind of theater speaks to you? What or who inspires you as an artist? : Honest theater tugs at my heartstrings. I don't like things that feel contrived, or pieces with too many inside jokes. I like work that goes deep into the heart of the human condition and draws out something that brings the audience together in a shared experience. In terms of inspiration, it's really the same kind of thing. I enjoy artists who have found a way of being themselves and that's who they share with their audience. Being completely honest in public is a scary thing and finding others who are attempting the same walk is encouraging in those times when fear might want to stall the process. If you could work with anyone you’ve yet to work with, who would it be? : That's a challenging question. There are so many talented artists. Off the top of my head, I would love to play with the bassist Bootsy Collins just once (to feel the funk live and in person, so to speak). And to dance with Mikhail Baryshnikov for reasons that may be inferred, not the least of which is his connection with Gregory Hines. What show have you recommended to your friends? : The Other Place, The Manhattan Theater Club's Broadway production was the most recent piece I've seen that really moved me. Who would play you in a movie about yourself and what would it be called? : That's a tough one. There was a time in which a lot of my friends thought I looked like David Schwimmer - so that might work, but I don't know how he would fair with the tap dancing aspects of the role. The movie would have to be called "All For Love". What’s your biggest guilty pleasure? : Sleep. With so much to do, I sometimes feel bad for the amount of enjoyment I get out of sleeping a lot. If you weren’t working in theater, you would be _____? : I have no idea. I've dabbled in graphic design, and have been told I have a good listening ear, so maybe a counselor of some sort, or a pastor. What’s up next? : We're hoping to continue working on this show - there are so many friends I'd like to share with the audience. In terms of other projects, I'll be traveling to teach workshops, and my tap dance company, Cats Paying Dues/CPD PLUS will be having it's New York Season in September, so we'll be gearing up for that over the coming months.